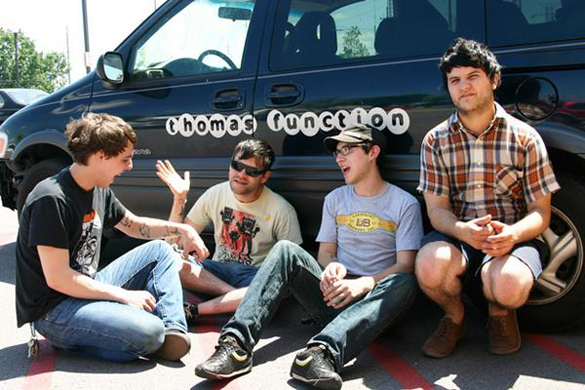 Huntsville garage virtuosos Thomas Function anchor The Independent's "Indiepaloozaroo II." That there was actually enough response to justify another one (4 nights of music, 4 nights of new local art next to the old records of once local bands nailed to the wall, 4 nights of something to do) is giving Heath Truitt the sigh-of-relief impression that things are getting better, that Auburn is about to emerge from behind the curve, that the Independent’s “Indepaloozaroo II” is worth the effort he’d still put into it even if it wasn’t. When Truitt, 35, moved back to the Plains from the comparatively thriving scene of Richmond, Va., in 2006, he found – except for the cover bands – a different town than the one he’d left eight years earlier. The record stores were boutiques; house shows were all but extinct. Since he couldn’t find the teaching job he wanted, he and a partner, Derek Davis, decided to put their money where their nostalgia was and do something about it. The result is located at 203 Opelika Road and along with the fruits of the Gnu’s Room-led renaissance of Southside Village, it – The Independent – is one of the few cultural something-to-dos Auburn currently has going for it. In terms of underground music, Truitt’s time as a student at Auburn in the mid-90s both coincided with and helped nurture what were arguably the town’s glory days. Thanks to the do-it-yourself dedication of folks like Truitt (who, in addition to picking up several guitars himself, booked shows at three different houses on his way to an Auburn degree in hotel and restaurant management), local bands had a reason to form and nationally touring bands – The Queers, Dillinger Four, Hot Water Music… – that might not have been able to find Alabama on a map the day before were regularly drenched in the sweat raining from the ceilings of houses on Glenn, Ross, Harper, Gay. 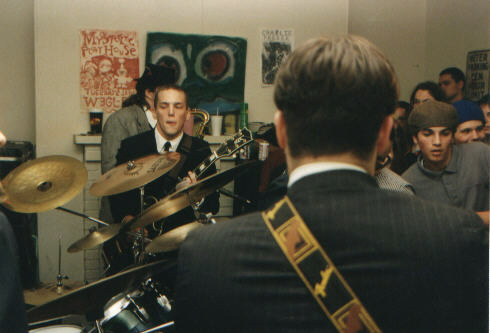 The Gossips play Heath Truitt's Cox Street house, January 1995. Minutes later, the floor caved in. Minus fear of the cops being called (plus the convenience of hummus and draught beer), those are the kind of nights The Independent has been trying to recreate since opening last March. The Indiepaloozaroo (Independent. Lollapalooza. Bonnaroo.) series is a good start. In addition to regional and local bands (The Bandar-Log, Summertrees), the four-day event will feature an exhibit by local artists Wayles Carpenter, Iris Talbot and Teil Duncan. Critically acclaimed Birmingham indie-rockers Vulture Whale anchored the first such event in January. The biggest draw this go-round will be Huntsville’s rock’n’roll buzz-band Thomas Function, whose Thursday night show in Auburn – the end of a winter tour – will be their last before returning to South by Southwest in March. “The goal is to remind [people in)]Auburn that they like watching live, original music,” he says. Indiepaloozaroo II starts tomorrow and lasts through Saturday, Feb. 6. An exhibit of works by local artists Wayles Carpenter, Iris Talbot and Teil Duncan will open at 6 p.m. tomorrow and be on display through March 5. Tomorrow (Wednesday) kicks off with progressive Tuscaloosa indie-rockers Baak Gwai (fronted by son of Auburn, John Snowden), the psychedelic pop-rock of Hattiesburg, Miss.’s Ben Shea, and Auburn’s dynamic synth-minimalist duo Summertrees. Thursday features Thomas Function from Huntsville and Summertrees. Friday it’s Birmingham’s hard-to-define, easy-to-like (and critically acclaimed) Through the Sparks (fronted by son of Auburn, Jody Nelson) and the funky, no-rules garage rock of locals The Bandar-Log. Saturday wraps up with the eclectic soul of Athens, Ga.-based The HEAP (with the bass of son of Auburn, Jeff Rieter) and the funky, throwback hard rock of An Abstract Theory from Muscle Shoals. The cost is $5 per night. Doors open at 9 p.m. Four-day passes are currently on sale at The Independent. Call 826-3151 for more info or visit www.myspace.com/theindependentauburn. Yes. Yes. Yes. This is what Auburn has been missing. I was in Auburn at the tail end of the 90’s, and I have fond memories of house shows and spinning good local music on WEGL. Even Auburn’s campus has lost some of the homegrown feel amid shiny new buildings. Sure, Foy Union wasn’t state-of-the-art, but it had a shabby, lovable feel. Congrats to these guys for bringing back a bit of the scruff-and-tumble that makes Auburn a special place. WEGL was a great radio station in the 90s. So many good bands were shared. About eight years ago I excitedly put it on 91.1 to hear total shite. Hopefully the kids can take over the dial again. Side note, we almost cave in a second story apartment at Lemans with a cover band rocking in the kitchen.